Are you having trouble with your e-portfolio? Don’t know where to start? First, what is the e-portfolio all about? Okay, which website is good for MY e-portfolio? There are so many! If you’re in a hurry, maybe you’re not sure if you want a bigger website right now, and you want the easiest option for just adding images/video, then Showtime.arts.ac.uk is probably for you. If you want to combine writing with images and/or video, then myblog.arts.ac.uk might be your best bet. If you want to collaborate with other students on projects or events, then I might choose workflow.arts.ac.uk. There are LOTS of options — all FREE for a website (although you can pay extra for more features)! If you want easy to use and pictographic controls, then Weebly is your guy. For medium difficulty with a lot of choices for customising the website for you, I would recommend WordPress. It’s also easier once you get used to it. If you want advanced customisation that might require a little technical know-how, then it’s Google Sites for you. 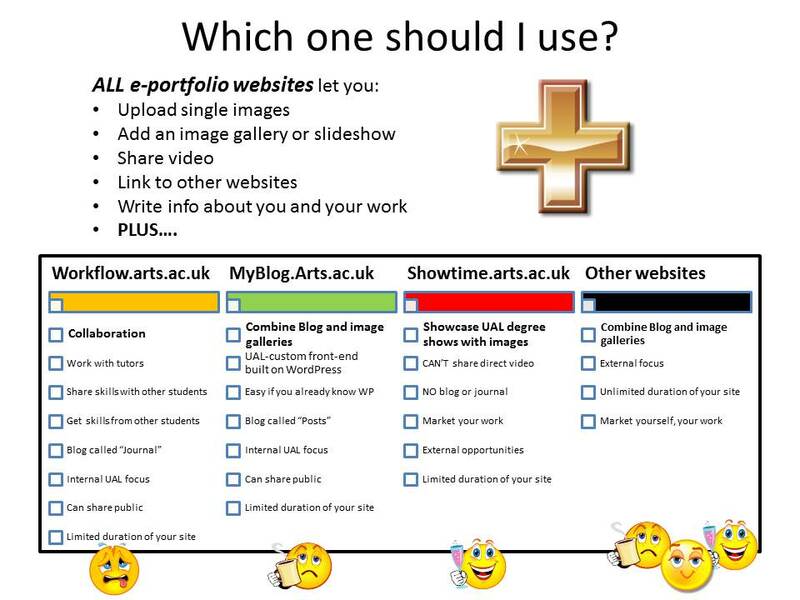 My favourite is WordPress for my e-research journal (keliseual.wordpress.com), and Google Sites for my original personal artist website (kelise.co.uk – 2012-2015). As of June 2015, I re-vamped my personal website to take advantage of the functionality and ready-made themes in WordPress (http://www.kelisefranclemont.com). However, I have used most of them at some point or another, and so have enough knowledge to help you out. I’ve chosen a website for my e-portfolio, help me get started! I have an e-portfolio started, but I still have questions! FAQs about blogging, WordPress, etc. What’s the difference between “tags” and “categories”? Categories help you organise and display your blog posts/articles into meaningful groups, and well-chosen categories help your readers identify what your blog/website is about. Click on a category and all the posts under that same category will appear. Tags help your reader navigate around your website/blog, and identify more general common themes, topics or ideas in your blog posts. Click on a tag, and a list of posts with that same tag will appear. Categories and tags for your blog do not help for your blog to be found on search engines such as Google; however, categories and tags are more helpful to your readers once they are on your site. How do I make sure my blog posts or website are found on Google? In a nutshell, Google works best by the use of algorithms that identify prominent keywords inside the body of the post, often found in: image captions, headers, and number of times a word is used in a post. Eg. if your post is about peanut butter, then an image should include in the caption the words “peanut butter” and there should be at least one header with the words “peanut butter”, as well as in the body of the text. There’s of course much more to it, but that’s a start! What’s the difference between “pages” and “posts”? Pages usually contain static information (like contact info, about details, artists statement, or a home page with logos and images). Pages rarely need updating and there are normally a limited number (3-5) of pages that appear at the top or bottom in sort of a menu/header bar. Posts are individual articles or pieces of text/images that appear in a website/blog in reverse chronological order (ie., the most recent post at the top). Think of posts like a newspaper or magazine, with the most recent stories appearing at the beginning. Posts are usually added much more frequently than pages (daily/weekly) and are often categorised so that similar posts can be searched and listed. Posts contain text, images, embedded video, hyperlinks, and tags.